I thought I might be interested in with helping out with patients and families as I did so with my brother years ago. 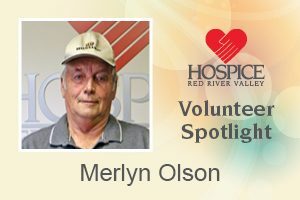 I felt like I needed to give back, and volunteering for Hospice was a great way to do so. I’ve enjoyed learning about the stages of end-of-life, Alzheimer’s and dementia. Artwork, picture painting, woodworking. I made two scale model tractors from wood and raffled them off, with the proceeds going to Hospice of the Red River Valley. They raised $2,195. Lefsa, ribs and Norwegian foods.